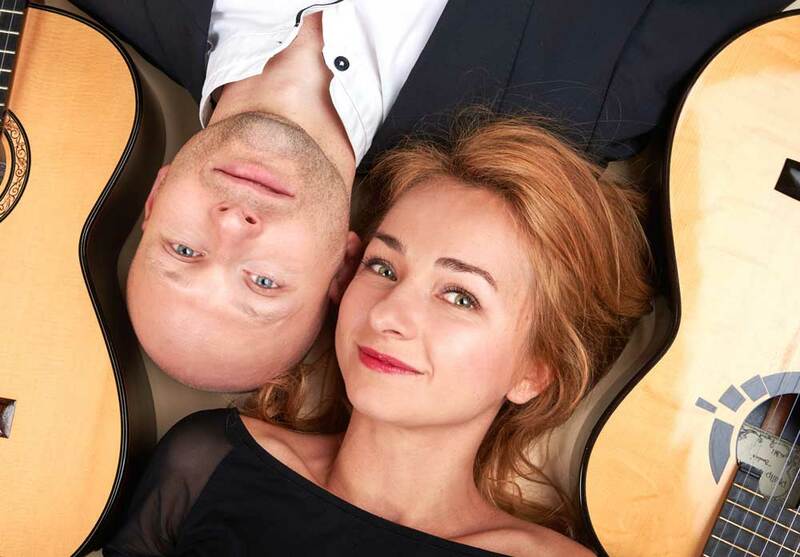 The Kupiński Guitar Duo is the peerless example of artistic talent in the world of classical music and one of Europe’s most renowned guitar duos. Acclaimed by both the public and critics alike as two musicians with a brilliant technique, passion, quality of sound and infinite elegance. In addition to the numerous solo achievements, after graduating the Karol Szymanowski Academy of Music in Katowice (guitar class of prof. Alina Gruszka and prof. Wanda Palacz) and Hochschule für Musik in Weimar (guitar class of prof. Thomas Müller-Pering), Ewa and Dariusz decided to establish the guitar duo, bringing to their performances a masterful sense of ensemble and charming personal chemistry. As soloists and in a duo they have won numerous awards in important international competitions (Weikersheim, Parma, Tychy, Viareggio, Bojano, Erwitte). They have been honoured multiple times with prestigious awards and scholarships for artistic achievements, such as “Young Poland” Scholarship, the Polish Minister of Culture and National Heritage Scholarship and DAAD. They have played recitals in Europe (e.g. Poland, England, Germany, France, Slovakia), USA (e.g. Washington, Houston, San Jose, Oklahoma City, Louisville), Mexico and China. As a part of their passion for education, they have been invited to give Master Classes in Europe, Asia and USA. Ewa holds the Habilitation degree in guitar performance and is currently teaching at the Institute of Music of Jan Długosz University in Częstochowa. In 2011 their debut CD “SPANISH MUSIC” has been released. From that time this husband and wife duo has been gaining momentum and attracting fans throughout the World. Their latest CD (2016) features mostly arrangements of music of Chopin, Rossini, Piazzolla and Gershwin. With a growing reputation for performing with tremendous energy and artistry, their aim is to create a rich and varied concert experience for audience through great performances of great music.